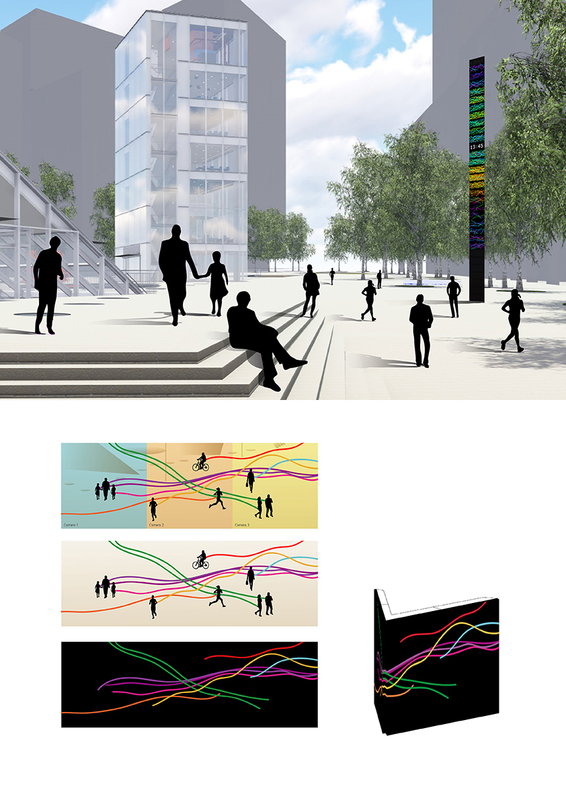 Data Tower was among 4 finalists for the Green Square Library and Plaza in Sydney public art commission. through out the day.Hence, the Data Tower will show much more than time, it will tell us the activity of people each hour. The moving pattern of a person will be converted into a line traveling around the Data Tower. The color of a line will be determined by the speed of a pedestrian. Living in the data and surveillance age, we have decided to track the people on the square and let them generate data, which will be used as an artistic material by us as artists. By sculpturing data the way described, the installation will demonstrate the plaza’s pace of life for the last 23hours. Thus, one could see which hours are the most active or empty in the location. Maybe during the weekends the Data Tower will be more full of traces generated by people in comparison to the week days. To be more specific, people in the square age going to generate traces on the screen of corresponding hour. Each hour has a screen. And in the screen of current hour will be shown actual time. Pedestrians and their speed have been not random choices for us, we were quite inspired by the early studies of Borstein & Borstein, who had discovered in the 1970s a positive correlation between the speed of pedestrians and size of the city. In short, it was found that the speed of people is descriptive for a place and other way round. To sum up, the proposed installation aims to communicate back the life and the culture of plaza and, at the same time, the people will be actually composing the work. The main aim is to go beyond visual aesthetics and create a relationship between citizens and public space.